(Boston, MA) Every now and again, a piece comes along that’s so far out of the box it defies most reasonable explanation. Liars & Believers has a history of creating such pieces, integrating clowning with storytelling and adventure in original works that thrill and excite. 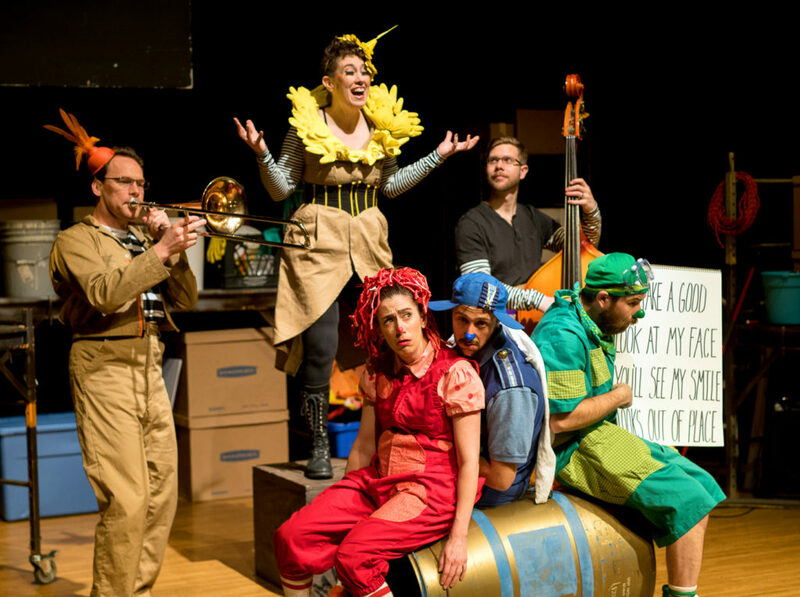 Yellow Bird Chase is a creative and vibrant exploration of the imagination. For that, I found the piece a bit confused (and confusing). The story is simple: a few maintenance workers (clowns who speak in gibberish) discover a yellow bird that leaves them with an egg. They undertake an epic adventure to find the bird after it flies off to return the egg… or maybe to capture it an make money off of more eggs depending on which clown you ask. This wasn’t the confusing part. The performers are truly top notch. Jesse Garlick, Rebecca Lehrhoff, and Glen Moore are incredible in their roles as clowns (Marco, Ruffles, and Poodge respectively). They perform with vibrant energy and child-like enthusiasm, drawing us in to their antics with their glee and charm. The freedom and excitement with which they performed drew perhaps the highest compliment I can imagine for a clown; at one point during a particularly gymnastic portion of the performance the six-year-old sitting in front of me turned to his dad and asked: “how come we’re not allowed to do that?” They made everything they were doing look like fun, and as a result we wanted to join them in whatever it was they were up to at any given moment. This also wasn’t the confusing part. Luminati provided live musical interludes to the action. Here’s where things get confusing. Johnny Blazes, Brendan Higgins, and Tim Lewandowski are incredibly talented and I enjoyed the music very much. That said, it didn’t seem to mesh stylistically with the action presented. While the clowns were clearly right out of a children’s show, the music was generally old jazz standards and blues tunes. It was sophisticated and smooth, wonderful to experience, but for the most part (and with a few very notable exceptions) had little to do with the action onstage. As such, it seemed weird to stop the story in order to launch into a musical number that happened outside of and around the play. It was almost like there were two shows happening simultaneously on the same stage: one about these clownish maintenance folks on a great adventure performed for the kids, and a musical cabaret of sophisticated tunes for the adults. Unfortunately, smashing them together in turn didn’t really create cohesion and instead gave us a delightful smorgasbord for the senses without a clear sense of who the audience was intended to be, or what the point of this piece generally was. Was it children’s theatre nodding to the inevitable adult contingent? Was it elegant music asking adults to bring out their sense of play and fun? I’m still not really sure. Unfortunately, I think the piece was also a bit long for what it was (this opinion seemed to be shared by the mother/daughter pair who walked out about forty five minutes in). At seventy minutes with no intermission, it’s quite a commitment for younger audiences and gets a tad plodding for more mature patrons. I think if they could have trimmed it down to a slim forty minutes, integrated the music, and given themselves clarity about what they were doing and for whom, it would have benefited immensely. But perhaps the devil’s in the details. Costumes by Kendra Bell were vibrant and wonderful, expertly supporting the world and the characters onstage. Puppetry design and direction by Penny Benson with the help of Faye Dupras made the simple story come alive in unexpected ways. Set design and props by the multi-talented Rebecca Lehrhoff was minimalistic and dynamic at the same time. The show makes creative use of various methods of subtitles to be inclusive to deaf audience members, and that was wonderful to see. It is well-produced, well-acted, and well-performed. I only wish it had a touch more refinement. This entry was posted in Comedy, Uncategorized and tagged 2017, Boston, Brendan Higgins, Chris McIntosh, Danielle Rosvally, Faye Dupras, Glen Moore, Jason Slavick, Jesse Garlick, Johnny Blazes, Kendra Bell, Liars & Believers, Liars and Believers, Luminati, MA, May, Rebecca Lehrhoff, Tim Lewandowski, Yellow Bird Chase by Danielle Rosvally. Bookmark the permalink.